TMI AutoTech, exclusive North American manufacturer of the Ariel Atom, together with Honda Performance Development(HPD) are pleased to announce the launching of an exciting new racing series that will provide grassroots racers with an affordable, competitive, wheel-to-wheel series. Building on the incredible worldwide success of the Ariel Atom as an ultra-performance track-day car, the only next logical step is to transform it into a successful competition car. The Spec Race Atom (SRA) competition vehicle builds on the Atom 3 production chassis with the addition of a SRA specific roll structure as well as other motorsport safety additions. Performance is kept reliable and consistent with the use of naturally-aspirated Honda K20 engines from HPD. The 2011 Spec: RaceAtom series presented by Honda Racing/HPD will mark the first time in the 10 year history of the Ariel Ato m that there has been an exclusive one-make series for this exciting vehicle. Florida-based Honda racer Shea Holbrook rewrote the SCCA World Challenge record book during its recent Long Beach round, becoming only the second woman in series history – and the first in the Touring Class – to win a World Challenge race in the 22-year history of the production-based racing series. Driving her #67 Lucas Oil/Shea Racing Honda Civic Si, Holbrook’s victory capped a dramatic month for the 21-year-old University of Central Florida student, who was piloting her third different Honda in as many races. After her own Civic sustained significant damage in the season-opening race at St. Petersburg, Holbrook utilized a back-up Honda from Compass360 Racing in the second St. Pete race. 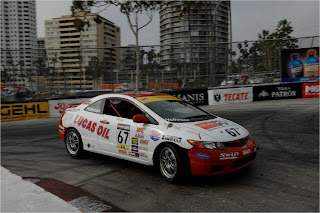 She drove a Peterson Racing Civic Si to her Long Beach victory. The drama continued following the checkered flag on Sunday. Holbrook had finished second on the track to Rafael Navarro, already the best finish of her short, two-year professional racing career. But Navarro’s Volkswagen was found to be non-compliant in post-race technical inspection, handing the win to an initially disbelieving Holbrook. Holbrook also becomes the third-youngest woman to win a race at Long Beach, trailing Simona de Silvestro’s win in the Atlantic Championship at the age of 19 in 2008 and Danica Patrick’s Pro/Celebrity race win at the age of 20 in 2002. Qualifying seventh in the Touring Car class, Holbrook managed to avoid a number of issues that eliminated other drivers at the 11-turn, 1.968-mile California street circuit. Three Touring Cars came together just after the start, ending the day for pole qualifier Lawson Aschenbach’s Compass360 Honda Civic. Holbrook had moved to third after the opening lap, and fell to fourth on Lap Two after being passed by Navarro, but she was back in a podium position again on Lap 10 after passing Eric Meyer”s Mazda RX-8. Holbrook moved past Devin Cates’ Volkswagen GTI on Lap 15 and had only Navarro’s Touring Car ahead of her at the checkers. Holbrook’s racing career has been used to raise funds and awareness for Parent Project Muscular Dystrophy, a charity seeking a cure for Duchenne Muscular Dystrophy. Using donations from fans and corporate partners both at and away from the track, Holbrook and Shea Racing have raised more than $20,000 in a little more than a season in World Challenge. Round Four of the SCCA Pirelli World Challenge Championship is scheduled for May 29-30 at Miller Motorsports Park, with Holbrook third in the drivers’ championship. Holbrook has 252 points, trailing fellow Honda racer Aschenbach (367) and Cates (278). Holbrook’s win also boosted Honda to a three-point lead over Volkswagen in the Manufacturers’ Championship. The Long Beach Grand Prix World Challenge event will be televised on VERSUS, April 30, at 2:30 p.m. EDT.